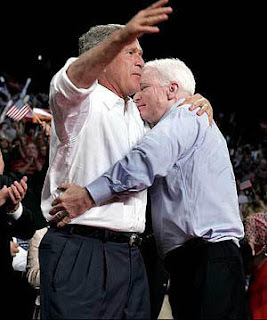 1-Bush's endorsement: congratulations, Johhny Boy. You just got a thumbs up from the worst president in U.S. history. What should American voters make of that? 2-He's a flip-flopper: it's one thing to practically make-out on stage with Bush. It's another to reverse course and stump hard to make permanent his tax cuts for the rich. How should this play in middle-America? 3-He's a self-proclaimed economic novice: is he the best we can get when the nation is in recession; has record home foreclosures; is reeling from a housing and credit crisis; is saddled with record debt, oil and gas prices; and experiencing anemic growth and employment? 4-He's rabid hawk: the scrappy little POW Vietnam vet seemingly never met a war he didn't like. He's said we should keep U.S. troops in Iraq for 100 years; he callously/cavalierly mangled a Beach Boys classic and sang "Bomb, bomb, bomb, bomb, bomb Iran..." when asked what we should do with the third partner in Bush's Axis of Evil; and his new web ad features Winston Churchill rambling about "never surrendering." You get the feeling McCain's next ad will warn of the real threat from the "Japs." Do we really need/want another reckless cowboy in the White House? 5-Questionable ethics: remember the Keating Five? How quickly we forget. Not a proud moment in the self-serving Senator's political career. Why don't we see more written about what a phony he is? 6-Bad temper: his anger-management issues are legendary. He's a guy who will ruthlessly skewer staffers and then end up apologizing profusely. Did you happen to catch his version of the mile-high club Friday when he verbally undressed the NY Times' Elisbeth Bumiller aboard the airborne Nasty-Talk Express? Seems like the curmudgeonly right-winger didn't like being asked about his 2004 vice-presidential flirtation with Democrat John Kerry. I guess when a chunk of your own party hates you for allegedly not being conservative enough, being Kerry's boy is not a timely thing to have to defend against. Do we really want an angry president? 7-Definitely won't be voted Mr. Congeniality by his peers: McCain has the dubious distinction of being disliked across both sides of the aisle. Is he a "maverick" or simply an angry old dude who seems to piss a lot of people off? 8-Age: McCain would be the oldest president in U.S. history. How will this affect his ability to be the leader of the free world? 9-Health: he's recovering from bouts of skin cancer in 1993 and 2000, and no one knows today's status of his condition, as his health records have remained private. He suffered from Melanoma, the least common form of skin cancer but the most lethal. Do we not have the right to know more about the seriousness of this, and perhaps other, health conditions of what would be a 72-year-old president? History will ultimately show that President Bush cleaned up after President Clinton allowed Al Qaeda to form, train, and practice on American targets in the 1990s. President Clinton enabled OBL to take sanctuary in Afghanistan. - the murder of innocent children in Waco Texas. I like your blog and you do make good points about John McCain. But of the candidates left in the presidential race in both parties, Senator McCain is heads and shoulders the best candidate. I say this as a lifelong Democrat who has never voted for a Republican for president. I am leaning to McCain this year because I do not think either Democratic candidate still standing has my confidence to answer the crisis phone. McCain has been there and then some. Bravo Ostroy. You have really laid out the terrible risk we'd be taking if we elected McCain. Even if he were perfect, which he is not, his health alone should make us cautious. I think I see a red, bloody mark on his face each time he appears. We need to see his medical records. Aside from that, anyone could answer the red phone at 3:am and give what we all know would be McCain's quick, unthought=out answer: NUKE 'EM. We do not need a crazy hot head making any decisions not backed up by what we hope would be the more level-headed legislature. That's how we got in this mess -- Bush had the power to start a war after lying about his plans. McCain showed his arrogance by not showing up on time for his meeting with Bush at the White House. No excuse for that display of self-centeredness and resentment. He's passive agressive which is not a productive attribute for a president. 10:48 No one hates blacks, women, poor people, Hispanics, Muslims, poor children and everyone else who is not a white male, than Republicans. Where have you been or are you a white male who is not at all introspective? Hillary Clinton has said repeatedly over the last few days that John McCain is worthy of being Commander-in-Chief and that settles the case for me. It's a huge thing for her to cross party lines and make an endorsement like that. She is a brilliant woman who deliberates carefully over all her pronouncements. If Hillary has vetted John McCain to be President, that's more than enough for me. No, 12:03. Hillary Clinton said that she and McCain had a record of experience that qualified them to be president. She did not say McCain was qualified to do it well. She was making a point about length of experience. They had "done their time." A C- student in any graduating class has "done his time" and is able to graduate along with the A+ student. The C- student can be a bully and cheat but that has nothing to do with his graduating The A student is usually an outstanding member of the class through her entire career.There are of course always other gifted students but they are undergraduates and have not "done the time" and would not be eligible to graduate. Whom would you want as president? I wonder why you would consider a recommendation by Hillary since you seem to think so little of her abilities to discern. “Whom would you want as President?” Hillary’s comments were not about putting down McCain; they were about putting down Obama. Hillary said that she and McCain are qualified to be Commander-in-Chief based on their experience, and that Obama is just a speech, i.e. not qualified. It was obviously a comparison and a clear attack on Obama. If she believes (but did not say) that McCain’s experience didn’t qualify him—ie he is a Bushie warmonger or a hothead or a C- Student or any of the things Andy points out so well above--then using McCain to put down Obama doesn’t make sense. Why bring McCain into it at all? Why appear in any way to praise the Republican nominee? Just say that she is more qualified than Obama and be done with it. Otherwise it can leave the impression that somehow we would be better off and safer with a McCain presidency than an Obama one. Your whole analogy about C- students, etc. is based on what she didn’t say. We can’t make any assumptions about her true beliefs from what she doesn’t say. Let her come out and say that it would not be a good thing for McCain to become Commander-in-Chief. If she does….then what’s the point of her attack on Obama? She can’t have it both ways. I am an Obama supporter, but I think that Hillary Clinton is an extraordinary woman and I will definitely vote for her if she is the candidate. I don’t see the contradiction. There is no contradiction between liking Obama and having respect for her. Many people are Clinton supporters but still like Obama. It’s just that these kinds of tactics make me very sad. I agree with everything Andy said above about McCain, and I think that statements from Hillary like this are short-sighted. They may create immediate advantage in a primary, but what will they mean later on if Obama should become the Democratic nominee? I can’t imagine anything worse that could ever happen than McCain winning. After all these years of Bush? Please, please stop and think about it for a minute. Think about the big picture. It is not about Obama and Clinton. The Democratic party must stick together. There is just too much at stake. We will see what Hillary Clinton does in the coming weeks and we will see what Obama does. He says he doesn’t want to get involved in a “knife fight.” Stay tuned. Obama cannot win. Read Nicholas Kristof's article in the TIMES today. The attack againstObama as a Muslim has started bigtime and it will strike so much fear, or at the least doubt in the minds of Americans that he will not be elected president if he's the nominee. If you think HIllary's calling him inexperienced is rough politics just look at what is already being said by Republicans. It will be worse than anything we saw against Dukakis and Kerry. And, it will inflame Muslims all over the world. Recently I visited an extremely highly respected dermatologist in the Denver area who informed me that over 200 dermatologists have signed a letter that will cnnfirm that McCain's melanoma has gone into his lymphoid. Sarah Palin running this country.